Martin E. Robins and PBF Consulting, 35 pages. 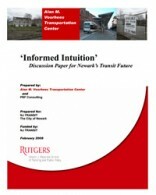 A report prepared for NJ TRANSIT and the City of Newark. February 2008.